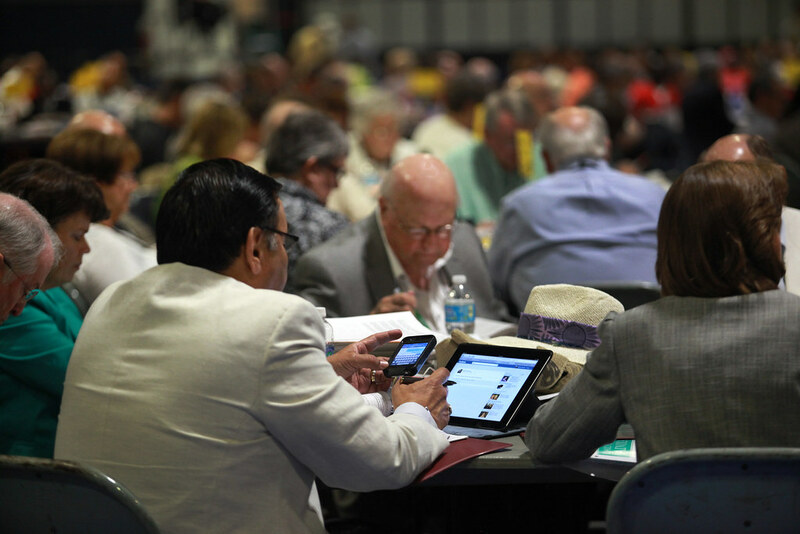 Delegate Eradio Valverde Jr. from the Southwest Texas Annula (regional) Conference multitasks while listening to the May 4 plenary session at the 2012 United Methodist General Conference in Tampa, Fla. A UMNS photo by Kathleen Barry. General Conference 2012 approved a budget of $603.1 million for seven general church funds during the 2013-2016 period; that total is 6.03 percent less than the amount apportioned for the previous four-year period the first time the assembly has accepted a lower budget than the amount set for the preceding period. That sounds like a whopping amount, but local churches should not count on huge savings, since only 2 cents out of every dollar in the collection plates go to support general church ministries. Also, costs of annual conference operations, clergy pension benefits and inflationary costs are likely to increase local church costs. Delegates approved two new line items in the World Service Fund. They established a new $5 million fund for theological education in central conferences and $7 million to recruit and train young clergy in the United States. That action, combined with earlier recommendations to reduce agency budgets by 6 percent, means general agencies will receive nearly 10 percent less money in the 2013-2016 period than they received in 2009-2012. The General Council on Finance and Administration reduced the Episcopal Fund by $3 million and gave $1.5 million to World Service to restore some funds to the general agencies. The finance agency also gave $1 million to cover deficits related to operating General Conference and allocated $500,000 to the General Administration Fund. While the $1.5 million will help agencies, and they may experience some savings in a reduced number of agency board members, those savings will be less than reductions and the rate of inflation over the next four years. Since all local churches do not pay the full apportionments, the amount received by all funds is less than the amount budgeted. In the past, receipts have hovered around 88 percent of the goal amount. The delegates called for the Advance Edition of the Daily Christian Advocate to be translated into Kiswahili, and increased the size of the Commission on General Conference, thus adding some $600,000 to the cost of the General Conference. The Commission on General Conference will struggle to find ways to reduce costs. For instance, it could decrease the number of delegates from 1,000 to 600 or decrease the number of days the assembly meets. It also could make greater use of technology and consider other cost-saving measures. Delegates continued the present apportionment formula that provides a percentage adjustment based on the economic strength in a conference, which is based on per-capita income in the area, and local church costs divided by the number of people in attendance. They also approved a requirement that general agencies receiving general church funds provide an annual report on the names of people receiving funds as outside contractors and the amounts paid. Peck* is a 12-time veteran of General Conference Once as a seminary student; once as a conference editor, three times as Newscope and Circuit Rider editor, four times as DCA editor and three times as UMNS editor. News media contact: Kathy Noble, Tampa, Fla., (813) 574-4837, through May 4; after May 4, Nashville, Tenn. (615) 742-5470, or newsdesk@umcom.org.